The combined live television network audience of the President's State of the Union address Tuesday night ranked 7th among all presidential SOTUs rated by Nielsen -- placing it behind Barack Obama's January 27, 2010 address and just ahead of Bill Clinton's January 25, 1994 address, according to a Research Intelligencer analysis of historical Nielsen data. 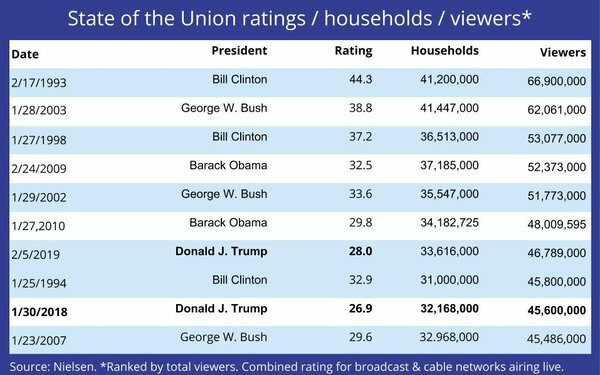 This year's address delivered a marginally higher television audience than last year's -- the current President's first State of the Union Address -- which ranks as the 9th most-watched SOTU -- just ahead of George W. Bush's Jan. 23, 2007 address. The No. 1 television audience goes to Bill Clinton's February 17, 1993 address, which delivered a combined network TV audience of 66.9 million and a 44.3 rating. "While coverage varied by network, 12 aired live coverage from approximately 9:00 p.m. ET to 10:30 p.m. ET," Nielsen said in a statement releasing Tuesday's SOTU ratings. "In terms of the social nature of the address, the State of the Union 2019 was the No. 1 most social program on Feb. 5, 2019," Nielsen continued, adding: "There were 15.2 million total interactions across Facebook, Instagram and Twitter about the State of the Union 2019. Of the 15.2 million total interactions measured, 12% occurred on Facebook, 5% occurred on Instagram and 84% occurred on Twitter." Nielsen said "the most social moment" on Twitter occurred at 10:13 p.m. ET with 82,000 interactions, as viewers tweeted in the minutes following the President’s condemnation of socialism and statement that “great nations do not fight endless wars,” referring to drawing down the number of American troops fighting overseas.